Last week I attended my first advanced Kintsugi class given by Gen Saratani, master Japanese lacquer restorer and artist. Kintsugi is the ancient Japanese art of repairing broken ceramics using lacquer and gold. In the spring I took a beginner class with him and repaired a chipped plate, which I posted earlier. 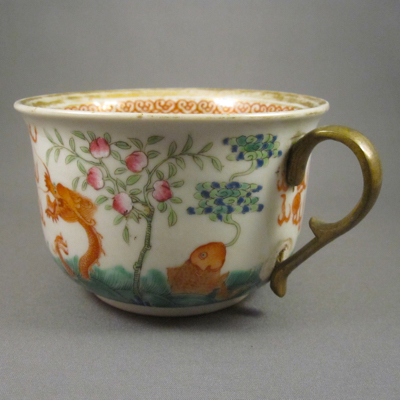 Hoping that I would find examples for inspiration at the Metropolitan Museum of Art in New York City, I did indeed stumble upon these early pieces. 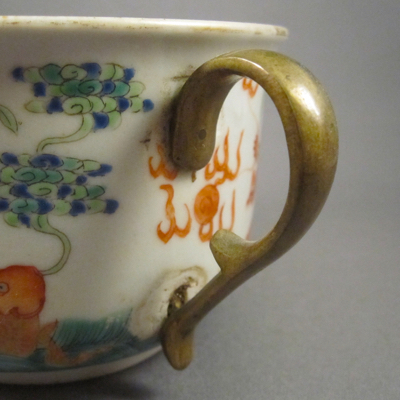 They are all Korean pottery: stoneware, porcelain & Buncheong ware. 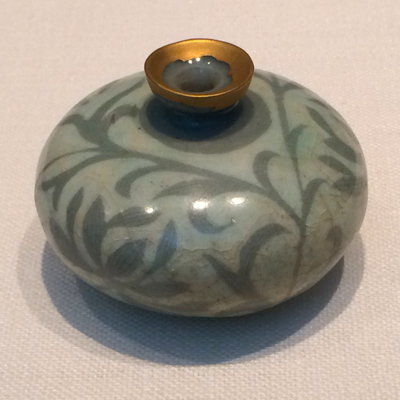 Oil bottle decorated with peony leaves Goryeo Dynasty (918-1392), late 12th century. 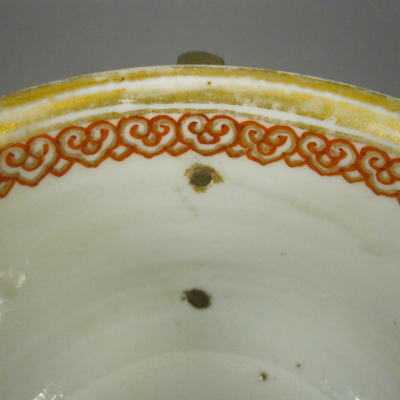 Stoneware with reverse-inlaid design under celadon glaze. 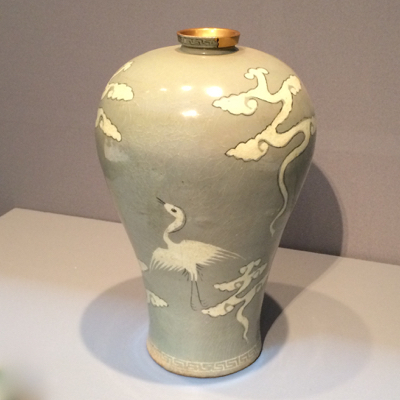 Maebyeong decorated with cranes and clouds Goryeo dynasty (918-1392), late 13th century. Stoneware with inlaid design under celadon glaze. 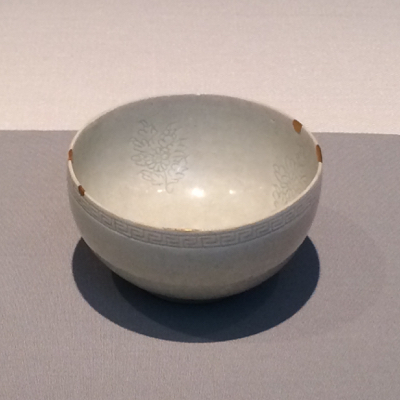 Small bowl decorated with chrysanthemum Goryeo dynasty (918-1392), 12th century. 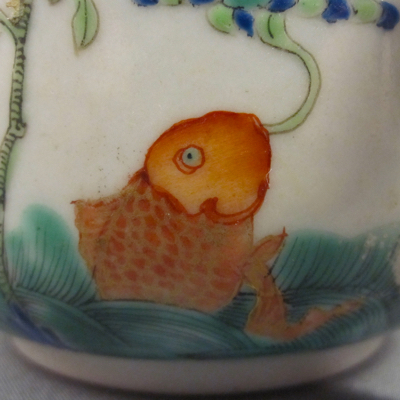 Porcelain with incised design. 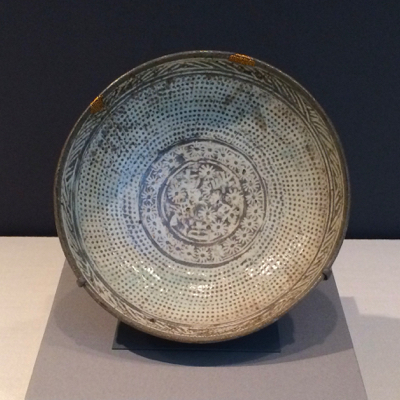 Dish with inscription and decorated with chrysanthemums and rows of dots Joseon dynasty (1392-1910), mid-15th century. 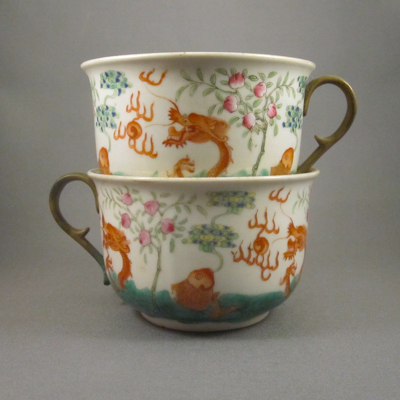 Buncheong ware with stamped design. 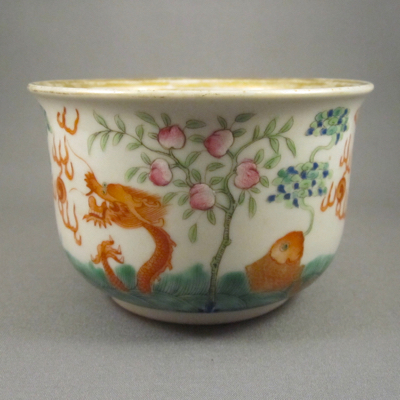 This porcelain cream jug with baluster form and a sparrow beak spout was made in China during the Qianlong period (1736-96.) 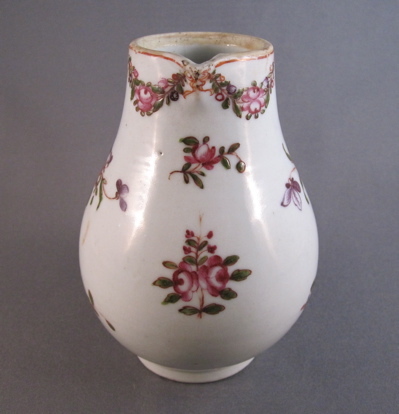 It is decorated in the Famille Rose palette and measures 4 inches high and is about 4 inches wide. The floral swag decoration suggests it was made for the French market. 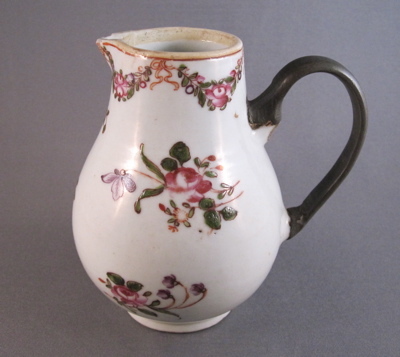 I can just imagine a French maid in the early 1800s, clearing the breakfast table, grabbing this little jug with fingers still dripping with butter from making croissants, and letting it slip and tumble to the ground. Sadly, the cover and handle must have broken into too many pieces to repair, so a tinker was engaged and created a pewter replacement handle. Not sure if the shattered cover or the maid with shattered nerves were ever replaced. 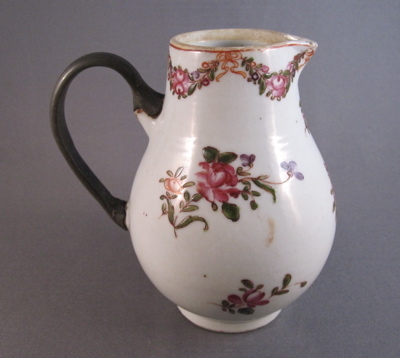 This jug with similar form and decoration shows what the the original handle and cover on mine looked like before it took a tumble. 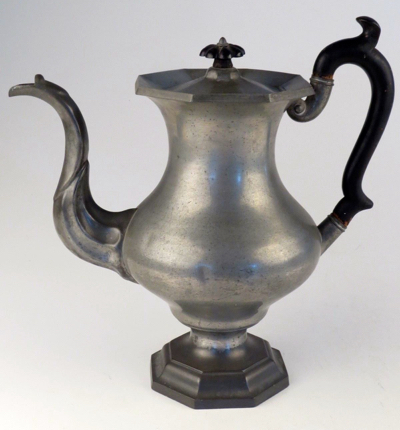 This unassuming pewter teapot was most likely made in America in the mid 19th century. 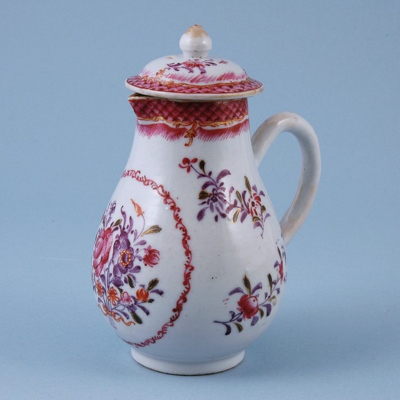 It stands 9 inches tall and has a fanciful wooden handle and knob. 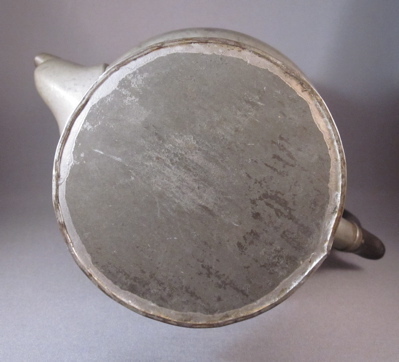 As pewter is a soft and malleable metal, many early pieces did not survive intact. 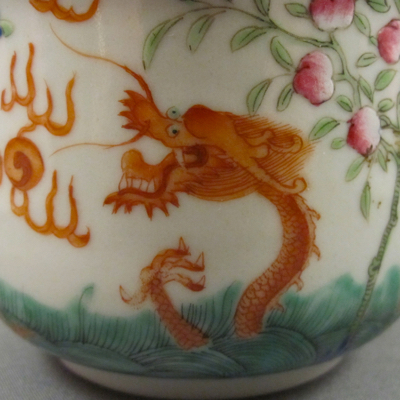 This pot is one such example. At some point during the past 160+ years, the original base was damaged and the tea stopped flowing. 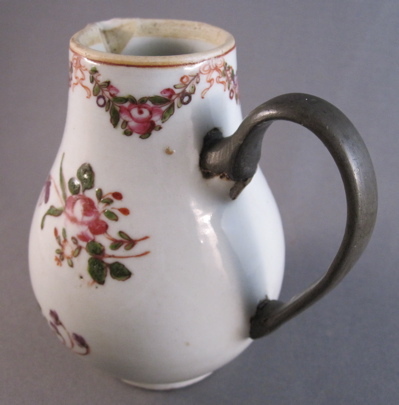 A tinsmith fashioned a simple tin conical foot as a replacement and the teapot was able to function once again. 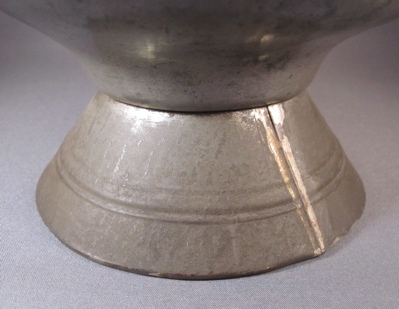 At the time of the repair, the shiny metal base stood in stark contrast to the dull pewter. But today, both metals appear to have melded and the repair is now hard to detect. 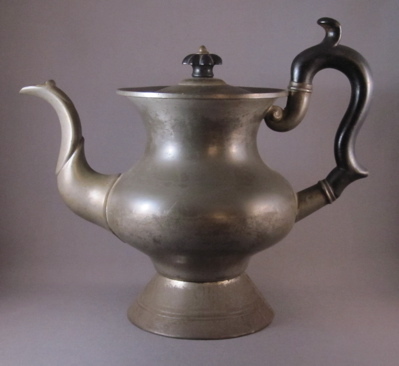 This pewter teapot with similar form suggests what the original base on mine might have looked like.